本发明实施例公开了一种面向用户的通信方法和路由注册方法及设备及通信系统。 Example discloses a communication method for a user registration and routing method and apparatus and communication system of the present invention. 其中的一种面向用户的通信方法，包括：第一域路由器接收第一终端发送的第一数据包，其中，第一数据包携带第一用户的用户标识和第二用户的用户标识，第一终端归属第一用户，第二终端归属第二用户；利用第二用户的用户标识，查询第二终端连接的第二域路由器；向第二域路由器发送第一数据包，以便于第二域路由器将第一数据包发送给第二终端。 A method for communication wherein a user, comprising: a first domain router first receives a first data packet sent by the terminal, wherein the first user data packet carries a first user identifier and user identifier of the second user, a first belongs to the first user terminal, a second terminal belongs to a second user; user identifier of the second user, the second query domain router connected to the second terminal; transmitting a first data packet to a second domain router, so that the second domain router a first data packet to the second terminal. 本发明实施例技术方案有利于增强对用户移动性的支持，降低用户移动性管理的实现复杂度。 Example embodiment of the technical solution of the present invention facilitate enhanced support for user mobility and reduce the implementation complexity of the user mobility management. 本发明涉及通信技术领域，具体涉及面向用户的通信方法和路由注册方法及设备及通信系统。  The present invention relates to communication technologies, and particularly relates to a communication method for a user registration and routing method and apparatus and a communication system. 位置(Locator)语义:从网络拓扑的角度来看，分配给某个终端(主机)的IP地址，表示该终端接入网络时的一个拓扑位置。  position (Locator) semantics: From a network topology perspective, assigned to a terminal (Host) IP address indicating a topological location of the terminal when the access network. 当终端移动时，它接入到网络的拓扑位置也就发生了变化，因此相应的IP地址也随之发生变化，IP地址具有Locator语义。 When the terminal moves, the position of which access to the network topology also changes, so the corresponding IP addresses will be changed, the IP address having Locator semantics. 标识(Identifier)语义:从应用的角度来看，IP地址代表了相应终端的身份，即IP地址在终端间通信过程中，作为了通信双方相互识别的一个标识。  identifier (Identifier) ​​semantics: from an application point of view, represents the identity of the IP address of the corresponding terminal, i.e., the IP address of the communication process between the terminal as a communication identifier mutual recognition. 在应用连接未断开的状态下，要求IP地址能够尽可能长时间的保持不变，IP地址具有Identifier语义。 In the application connection is not disconnected state, requires an IP address remains unchanged as long as possible, having Identifier IP address semantics. 在互联网设计之初，核心网络采用单播和尽力而为的发送模型，而且当时认为终端通常是静止的，且IP地址足够使用，当时，IP地址双重语义的简单设计，也是今天互联网取得的巨大成功的重要因素之一。  In the Internet beginning of the design, the core network and best effort unicast transmission model, and was considered terminal is usually stationary, and use enough IP addresses, time, IP address of the dual design simple semantics, but also the Internet today one of the important factors achieved great success. 但是，随着互联网用户的增多、无线网络的飞速发展以及人们对无处不在的通信需求的扩大，IP地址这种locator和Identifier稱合的做法导致了许多的问题,例如,其破坏了互联网分层结构中不同层次之间尽量减少耦合的原则，不利于每层各自独立地发展；以IP地址作为终端的身份标识难以实现不同网络区域之间的终端互访通信等；另外，IP地址的双重语义对移动性的支持不够好，即当终端移动时，终端的位置发生变化，IP地址也相应的改变，但终端的身份并未变化，此时就引入了矛盾。  However, with the increase of Internet users, the rapid development of wireless networks as well as people expand ubiquitous communication needs, IP address, and this locator Identifier said the combined approach led to many problems, for example, its destruction principle to minimize the coupling between different levels of hierarchy of the Internet, is not conducive to the development of each layer independently; IP address as the identity of the terminal is difficult to realize a communication terminal exchanges between different network areas; in addition, IP dual semantics address is not good enough to support mobility, that is, when a mobile terminal, a change in location of the terminal, IP addresses change accordingly, but the identity of the terminal does not change, this time on the introduction of contradictions. 移动通信和Internet的结合已经成为未来网络发展的趋势之一。  combination of mobile communications and the Internet has become one of the future trend of network development. 随着便携设备近年来的发展，用户希望能够随时随地与家人朋友分享日常生活，同时方便的从Internet上获取到所需的信息和服务，其中，用户是指参与通信服务活动的人，可以是一个自然人或多个人组成的集合。 With the development of portable devices in recent years, users want to be able to share daily life with family and friends anytime, anywhere, and easily access from the Internet to information and services for which the user is a person involved in the activities of communications services, can be a natural person or a collection of individuals. 现有技术提出了一种主机标识协议(HIP, Host Identity Protocol), HIP是一种将IP地址的双重语义分离的方案。  The prior art proposes a Host Identity Protocol (HIP, Host Identity Protocol), HIP is an IP address of the dual semantic separate programs. HIP的原理是:在传输控制协议(TCP, Transfer Control Protocol)层与IP层之间引入主机标识层，使用主机标识(HI，Host Identifier)来标识用户，而IP层的IP地址只用来进行网络层路由，即IP地址只保留Locator语义,而Identifier语义由HIP层的HI来表示，基于HIP的协议栈如图1所示。  HIP principle is: Host Identity Layer introduced between the transmission control protocol (TCP, Transfer Control Protocol) layer and the IP layer, the Host Identity (HI, Host Identifier) ​​to identify the user, and the IP address of the IP layer only used for network layer routing, i.e. only the IP address reserved Locator semantics, the HI is represented by the semantic Identifier HIP layer stack as shown in FIG 1 based on the HIP protocol. 在HIP中，HI是一个抽象概念，在实际应用中使用的是主机标识符(HIT，hostidentifier Tag),它是由HI进行128位哈希(Hash)得到的。  In the HIP, HI is an abstraction used in practical applications is a host identifier (HIT, hostidentifier Tag), which is a 128-bit hash HI (Hash) obtained. 如图1所示,传输层使用〈HIT，port(端口)>作为传输层标识符,而不使用〈IPadd(地址)，端口>，由主机标识层完成数据包中的HIT和IP地址转换；网络层对于传输层是屏蔽的，网络层的IP地址变化(例如，终端移动性引起的IP地址变化)不会影响到传输层的链路。 Shown, the transport layer using <HIT, port (port)>  1 layer identifier as a transmission without using <IPadd (address), port>, completed by the Host Identity Layer data packet HIT and IP address translation; the network layer is the transport layer for shielding, IP address changes in the network layer (e.g., IP address, terminal mobility change caused by) the link does not affect the transport layer. HIP中，主机标识符和IP地址之间是一种动态绑定关系，HIP提供了一套主机标识与终端IP地址的映射机制，即，首先引入新的基础设施设备:汇聚服务器(RVS，RendezvousServer)，用以存储终端的H1、HIT和IP地址等信息的绑定关系；然后，在域名服务器(DNS，Domain Name Server)中增加一条新的记录,存储终端的H1、HIT和该终端对应的汇聚服务器之间的绑定关系。  HIP between the host and the identifier is a dynamic IP address binding relationship, the mapping mechanism provides a HIP host identifier and terminal IP address, i.e., first to introduce new infrastructure device: convergence server ( RVS, RendezvousServer), to store the terminal information of the binding relationship H1, HIT and IP address; then, adding a new record in the domain Name server (DNS, domain Name server) in, Hl storage terminal, the HIT and the binding relationship between the convergence corresponding to the terminal server. 例如基于HIP交互数据包的过程中，当终端I需要发送数据包时,终端I先从DNS服务器查询汇聚服务器的HI及IP地址，并将初始的数据包发送到汇聚服务器，再由汇聚服务器将此数据包转发给终端2 ;终端I和终端2获知对方的网络地址后，后续的数据包不再通过汇聚服务器转发而是通信双方直接进行通信，除非通信双方中的其中一方地址发生变化。  For example HIP process based on the interaction data packet, when the terminal needs to send the packet I, the terminal queries a DNS server I convergence start of HI and the IP address of the server, and the original data packet to the convergence server, and then by this convergence server forwards the packet to the terminal 2; terminal I 2 and the terminal informed of each other's network address, the subsequent packets are not forwarded by the convergence server communication parties communicate directly but, unless the two sides, wherein one of the communication address generating Variety. 在通信过程中，如果其中一方的IP地址发生变化，如终端I移动时，终端I需要将自己的变化地址通知RVS、DNS、终端2以及其它的互联通信设备。 In the communication process, wherein if one of the IP address changes, such as when the mobile terminal I, I need to own terminal address change notification RVS, DNS, the network terminal 2 and other communication devices. 在实现本发明的过程中，发明人发现，HIP通信方式对用户的移动性支持相对较弱，用户移动性管理的实现相对比较复杂。  During the implementation of the present invention, the inventors found that, the HIP mobility support communication for relatively weak users, users realize mobility management is relatively complex. 举例来说，由于设备标识与网络空间结构无关，使得查找效率相对较低；DNS需要保存终端的H1、HIT和该终端对应的汇聚服务器之间的映射绑定关系，对于用户级的DNS而言，处理负荷过重；在映射关系改变时，终端需要分别向DNS, RVS以及其它的互联通信设备更新映射关系，使得终端处理负荷过重。 For example, since the device identifier and the network regardless of the spatial structure, so that the search efficiency is relatively low; DNS needs to be saved terminal H1, the mapping between the HIT and the binding relation corresponding to the terminal server aggregation, in terms of the user-level DNS processing overload; when changing the mapping relationship, each terminal needs to update the mapping relationship DNS, RVS and other Internet communications device, such that the terminal processing overload. 本发明实施例提供面向用户的通信方法和路由注册方法及设备及通信系统，有利于增强对用户移动性的支持，降低用户移动性管理的实现复杂度。  Example embodiments provide a user-oriented communication method and registration method and apparatus for routing and communication system of the present invention is conducive to enhanced support for user mobility, reducing the implementation complexity of user mobility management. 第一域路由器接收第一终端发送的第一数据包，其中，第一数据包携带第一用户的用户标识和第二用户的用户标识，第一终端归属第一用户，第二终端归属第二用户；利用第二用户的用户标识，查询第二终端连接的第二域路由器；向第二域路由器发送第一数据包，以便于第二域路由器将第一数据包发送给第二终端。 A first data packet  domain router first receives a first transmission terminal, wherein the first user data packet carries a first user identifier and a user identifier of the second user, the first user terminal belongs to a first, a second terminal belongs to the second user; user identifier of the second user, the second query domain router connected to the second terminal; transmitting a first data packet to a second domain router, to the first data packet to a second domain router in the second terminal. 第二域路由器接收第一数据包，其中，第一数据包携带第一用户的用户标识和第二用户的用户标识，第二终端归属第二用户；利用第二用户的用户标识，查询第二终端的本地位置标识；根据第二终端的本地位置标识，向第二终端发送第一数据包。  The second domain router first receives a data packet, wherein the first user data packet carries a first user identifier and a user identifier of the second user, the second terminal belongs to a second user; user identifier of the second user, query the home location of the second terminal identifier; according to the local location identifier of the second terminal, transmitting a first data packet to the second terminal. 第一域路由器获取第一终端的设备标识和第一用户的用户标识，其中，第一终端归属第一用户；向当前域的用户位置服务器发送路由注册消息，该路由注册消息携带第一终端的设备标识、第一用户的用户标识以及第一域路由器的关联信息。  obtaining a first domain router first terminal device identifier and a user identifier of the first user, wherein the first terminal belongs to a first user; sends a routing message to the registered subscriber location server of the current domain, the routing message carrying the registration of a terminal device identifier, the first association information and the first identifier of the user of the domain router. 第一用户位置服务器接收第一路由注册消息，其中，第一路由注册消息携带第一终端的设备标识、第一用户的用户标识和第一域路由器的关联信息，第一终端归属第一用户；从第一路由注册消息获取第一终端的设备标识、第一用户的用户标识以及第一域路由器的位置标识；保存所述获取的第一终端的设备标识、第一用户的用户标识以及第一域路由器的关联信息。  a first subscriber location server receives a first route registration message, wherein the first registration message carries routing device identifier of the first terminal, the first association information and the user identifier of the first user domain router, a first terminal of a home a user; acquisition device identifier of the first terminal from a first route registration message, the first user and the user identifier identifying the first domain router location; storing the acquired device identification of the first terminal, a first identifier of the user and a related information of the first domain router. 接收模块，用于接收第一终端发送的第一数据包，其中，第一数据包携带第一用户的用户标识和第二用户的用户标识，第一终端归属第一用户，第二终端归属第二用户；查询模块，用于利用第二用户的用户标识，查询第二终端连接的第二域路由器；发送模块，用于向第二域路由器发送第一数据包，以便于第二域路由器将第一数据包发送给第二终端。  a receiving module, configured to receive a first data packet sent by a first terminal, wherein the first user data packet carries a first user identifier and a second identifier of the user, a first user terminal belongs to the first, second a second user terminal belongs to; query module, for using the second user's user ID, query a second domain router connected to the second terminal; transmitting means for transmitting a first data packet to a second domain router, so that the second the domain router first data packet to the second terminal. 接收模块，用于接收第一数据包，其中，第一数据包携带第一用户的用户标识和第二用户的用户标识，第二终端归属第二用户；查询模块，用于利用第二用户的用户标识，查询第二终端的本地位置标识；发送模块，用于根据所述查询模块查询的第二终端的本地位置标识，向第二终端发送第一数据包。  a receiving module, configured to receive a first data packet, wherein the first user data packet carries a first user identifier and a user identifier of the second user, the second terminal belongs to a second user; query module for utilization two user's user ID, query the home location identifier of the second terminal; and a sending module, according to the local location identifier of the second terminal of the querying module transmits a first data packet to the second terminal. 接收模块，用于接收第二终端发送的第一数据包，其中，第一数据包的包头携带第一用户的用户标识、第二用户的用户标识以及第一终端连接的第一域路由器的位置标识，第一终端归属第一用户，第二终端归属第二用户；包头修改模块，用于修改第一数据包的包头，其中，修改后的第一数据包的包头携带第一用户的用户标识、第二用户的用户标识、第一终端连接的第一域路由器的位置标识以及第二域路由器的位置标识；发送模块，用于向第一域路由器发送所述包头修改模块修改包头的第一数据包。 First domain  a receiving module for receiving a first data packet sent by the second terminal, wherein the first packet header carrying a first identifier of the user, a user ID and a second user terminal connected to a first location identifier of the router, the first terminal belongs to a first user, a second terminal belongs to a second user; header modification module for modifying the first data packet header, wherein the header of the first packet of a first modified user carries location identifier identifying the user, the second user's user identifier, location identifier of the first domain router connected to a first terminal and a second domain router; transmitting means for transmitting to a first domain router in the header header modification module modifies a first data packet. 获取模块，用于获取第一终端的设备标识和第一用户的用户标识，其中，第一终端归属第一用户；发送模块，用于向当前域的用户位置服务器发送路由注册消息，该路由注册消息携带第一终端的设备标识、第一用户的用户标识以及第一域路由器的关联信息。  obtaining module, configured to obtain the device identifier of the first terminal and a first identifier of the user, wherein the first terminal belongs to a first user; sending module, configured to send a registration message to route the user location server of the current domain, the route registration message carries the identifier of the first terminal apparatus, information associated with a first user and a first user identifier of the domain router. 接收模块，用于接收第一路由注册消息，其中，第一路由注册消息携带第一终端的设备标识、第一用户的用户标识和第一域路由器的关联信息，第一终端归属第一用户；获取模块，用于从所述接收模块接收的第一路由注册消息获取第一终端的设备标识、第一用户的用户标识以及第一域路由器的位置标识；关联保存模块，用于保存所述获取模块获取的第一终端的设备标识、第一用户的用户标识以及第一域路由器的关联信息。  a receiving module, configured to receive a first route registration message, wherein the first registration message carries routing identifier of the first terminal apparatus, information associated with a first user of a first user identifier and the domain router, a first terminal of a home a user; obtaining module, configured to route a first registration message received from the receiving module to obtain the device ID of the first terminal, a first location identifier and the identifier of the user of the first domain router; association storing module, for storing the acquisition module acquires the device identification of the first terminal, the first association information and the first identifier of the user of the domain router. 第一域路由器，用于接收第一终端发送的第一数据包，其中，第一数据包携带第一用户的用户标识和第二用户的用户标识，第一终端归属第一用户，第二终端归属第二用户；利用第二用户的用户标识，查询第二终端连接的第二域路由器；向第二域路由器发送第一数据包；第二域路由器，用于接收第一域路由器发送的第一数据包，其中，第一数据包携带第一用户的用户标识和第二用户的用户标识；利用第二用户的用户标识，查询第二终端的本地位置标识；根据第二终端的本地位置标识，向第二终端发送第一数据包。  The first domain router, for receiving a first data packet sent by a first terminal, wherein the first user data packet carries a first user identifier and a second identifier of the user, a first terminal belongs to a first user, a second terminal belongs to a second user; user identifier of the second user, the second query domain router connected to the second terminal; transmitting a first data packet to a second domain router; second domain router, for receiving a first domain router a first data packet, wherein the first user data packet carries a first user identifier and a second identifier of the user; using the second user's user ID, query the home location identifier of the second terminal; according to a second terminal local location identifier, transmitting a first data packet to the second terminal. 本发明实施例中基于用户标识模型，在网络中实现面向用户的通信；由于用户标识相对比较稳定，数据包的传输基于用户标识，通信可靠方便，有利于增强对用户移动性的支持，降低用户移动性管理的实现复杂度。  Examples based on the user identification model embodiment of the present invention, to achieve a user-oriented communication network; because the user ID is relatively stable, the transmission of data packets based on user identification, communication reliable and convenient, facilitate enhanced support for user mobility reduced user mobility management implementation complexity. 为了更清楚地说明本发明实施例和现有技术中的技术方案，下面将对实施例和现有技术描述中所需要使用的附图作简单地介绍，显而易见地，下面描述中的附图仅仅是本发明的一些实施例，对于本领域普通技术人员来讲，在不付出创造性劳动性的前提下，还可以根据这些附图获得其他的附图。  In order to more clearly illustrate the technical solutions according to the prior art and the present embodiment of the invention, briefly introduced hereinafter, in the following description and the accompanying drawings embodiments described in the prior art needed to be used in describing the embodiments the drawings are only some embodiments of the present invention, those of ordinary skill in the art is concerned, without any creative effort, and can obtain other drawings based on these drawings. 图15是本发明实施例十二提供的一种通信系统的示意图。  FIG. 15 is a schematic diagram of a communication system according to the present embodiment of the invention provides twelve. 本发明实施例提供一种面向用户的通信方法和路由注册方法及设备及通信系统，有利于增强对用户移动性的支持，降低用户移动性管理的实现复杂度。  Example embodiments provide a user-oriented communication method and registration method and apparatus for routing and communication system of the present invention is conducive to enhanced support for user mobility, reducing the implementation complexity of user mobility management. 为使得本发明的发明目的、特征、优点能够更加的明显和易懂，下面将结合本发明实施例中的附图，对本发明实施例中的技术方案进行清楚、完整地描述，显然，所描述的实施例仅仅是本发明一部分实施例，而非全部实施例。  The object of the present invention such that the invention, features, and advantages more comprehensible, the present invention in conjunction with the accompanying drawings in the following embodiments, the technical solutions in the embodiments of the present invention will be clearly and completely described, clearly , the described embodiments are merely part of embodiments of the present invention, but not all embodiments. 基于本发明中的实施例，本领域普通技术人员在没有做出创造性劳动前提下所获得的所有其他实施例，都属于本发明保护的范围。 Based on the embodiments of the present invention, all other embodiments of ordinary skill in the art without any creative effort shall fall within the scope of the present invention. 本发明实施例提出用户标识模型，其中定义了用户标识(User ID)、设备标识(Device ID)和位置标识(Locator)。 Example user identifier proposed model  The present invention, which defines the user identification (User ID), a device identifier (Device ID) and a locator (Locator). 其中，User ID用于标识一个用户，或某个用户的一次签约(subscription), UserID是一个全局唯一的标识。  wherein, User ID for identifying a user, or a user of a subscription (subscription), UserID is a globally unique identifier. Device ID用于标识用户的一个终端设备，它可以是全局唯一的网络内设备标识，例如可以是媒介访问控制(MAC，Media Access Control)地址、国际移动用户识别码(MSI，international mobile subscriber identity)、或网络接入标识(NAI, Network AccessIdentifier)等等；当然也可以是仅在当前用户所有设备中唯一的一个标签,例如设备编号、设备名、或者设备类型等等。 A terminal device  Device ID's for identifying the user, it may be a globally unique network device identifier, for example, may be a media access control (MAC, Media Access Control) address, international mobile subscriber identity (MSI, international mobile subscriber identity), or a network access identifier (NAI, network AccessIdentifier) ​​and the like; of course possible only in the all user equipment is currently the only one label, e.g. device number, device name, device type, or the like. 用户的终端可以是计算机、便携机、手机、智能终端、车载设备、电话等，或其它的终端设备。 The user terminals may be computers, laptops, mobile phones, smart terminals, automotive equipment, telephone, or other terminal equipment. Locator是可路由的位置标识，例如可以是IP地址、或其它位置标识，用于指示终端的位置。  Locator location identifier is routable, for example, may be an IP address or other location identifier, indicating the location of the terminal. 本发明实施例中，对于每一个用户来说，其User ID、Device ID和Locator是相互关联的。 Embodiment, for each user, its User ID, Device ID, and are interrelated Locator embodiment  of the present invention. 一个用户可拥有一个或多个终端，一个终端又可以被分配一个或多个Locator。 A user may have one or more terminals, but one terminal may be assigned one or more Locator. 如图2-a所示，可以理解为一个User ID可以关联到I个或多个Device ID，一个Device ID可关联到I个或多个Locator,从而,一个User ID可以关联对应到I个或多个Locator。  As shown in FIG. 2-a, can be understood as a User ID can be associated with one or more I Device ID, a Device ID can be associated to one or more I Locator, thus, it can be associated with a User ID to the corresponding I or more Locator. 参见图2_b，本发明实施例中还提出一种面向用户通信的网络架构。  Referring to FIG 2_b, embodiments of the present invention further provides a user-oriented communication network architecture. 首先，可以从逻辑上将网络全局划分为多个域(Domain)，具体可以依据网络拓扑信息、运营策略或地理位置信息等进行域划分。  First, the network can be divided logically into a plurality of global domains (the Domain), specifically the network topology information, location information, or operating strategy like domain division basis. 进一步的，可以在每个域中配置域路由器(DR，Domain Router)和用户位置服务器(SLS, Subcriber Location Server)。  Further, the configuration may be domain router (DR, Domain Router) for each user and a domain location server (SLS, Subcriber Location Server). 其中，SLS用于实现控制面功能，可以关联保存用户标识(User ID)、归属于该用户的终端的设备标识(Device ID)、该终端的路由信息(例如，可以包括:该终端的家乡域信息、当前域信息、与该终端连接的DR的位置标识等)、用户的签约信息等等。  wherein, SLS for implementing control plane functions, can be associated with stored user identification (User ID), assigned to the device identifier (Device ID) of the user terminal, the routing information of the terminal (e.g., may comprise: the terminal the home domain information, current domain information, the DR is connected to the terminal location identifier, etc. ), the user's subscription information and the like. DR用于实现用户面功能，例如可以执行数据转发的功能、保存用户标识和分配给该用户的终端的位置标识(user ID和Locator)等。  DR for implementing the user plane functions such as data forwarding function may be performed, and a user identifier assigned to a save location identification (user ID and Locator) and the like of the user terminal. 基于不同的需要，每个域中可以配置一个SLS和至少一个DR。  Based on different needs, each domain can be arranged at least a SLS and a DR. SLS与DR之间可以配置通信接口，用于DR向SLS查询用户的路由信息，以及更新用户标识信息和路由信息等。 The communication interface may be configured between SLS and DR, DR a query for routing information to the user SLS, and update the routing information and the user identification information. 当然，也每个域中也可以只配置DR，并将SLS实现的功能集成在各个DR中，本发明实施例以每个域中同时配置一个SLS和至少一个DR为例，进行具体说明。 Of course, each domain may be disposed only DR, and SLS functions implemented in each integrated DR, the embodiment of the present invention to configure each domain at least one of a SLS and DR, for example, be specifically described. 进一步的，有签约关系的不同域的SLS之间也可以配置通信接口，以用于不同域间的路由信息查询，例如，拜访域的SLS可以根据User ID向家乡域的SLS查询与用户的终端连接的DR的位置标识。  Further, the relationship between the SLS have signed different domains can also be configured a communication interface, a query for routing information between different domains, e.g., SLS visited domain may query the home domain according SLS User ID and the DR position of the user's terminal connection identification. 进一步的，为便于在不同运营商的网络中统一管理用户标识，例如可以由第三方网络或在Internet中部署一个独立于各个域的全局SLS (global SLS),全局SLS与各个域的SLS配置通信接口，各个域内的SLS可通过该通信接口向全局SLS查询用户的家乡域信息或当前域信息等。  Further, in order to facilitate unified management of users in different operator's network is identified, for example, may be deployed by a third party on the Internet or a network independent of each domain's global SLS (Global SLS), and each domain global SLS a communication interface configured SLS, SLS each domain may query the user's home domain information and domain information to the global current SLS via the communication interface. 进一步的，在每个域内，可以使用本地位置标识(local Locator)来标识位置，实现域内数据包的路由，可以理解，local Locator不要求全局唯一，只要求域内唯一。  Further, in each domain, can use a local location identifier (local Locator) to identify the position, for routing data packets within, it can be appreciated, local Locator is not required to be globally unique, unique only within required. 当然，分属于不同域的网络实体间通信、或域内网络实体与Internet上的网络实体通信时，可使用全局位置标识(global Locator)来标识位置，实现域间数据包的路由，可以理解，global locator要求全局唯一。  Of course, when the inter-network entities belonging to different fields of communication, or at the network entity entity that communicates with the Internet network, can use the global location identifier (global Locator) to identify the position that the route inter-domain packets to be understanding, global locator globally unique requirements. 利用Locator来标识同一个域内各个节点设备(包括终端、DR等网元)的位置，其中，DR同时拥有local Locator和Global Locator,终端的local Locator可以由对应的DR或网关(GW, Gateway)分配,其中，终端的local Locator用于域内通信；当其需要与域外节点通信时，可以由与其连接的DR执行从1calLocator到global Locator的网络地址转换，而终端通信时使用的global Locator为与其连接的DR的global Locator。  With the Locator identified with the respective node devices in a domain (including a terminal, DR, etc. NE) position, wherein, DR have both local Locator and Global Locator, local Locator terminal may be by the corresponding DR or gateway (GW, Gateway) allocation, wherein, local Locator art terminal for communication; when a node needs to communicate with the outside thereof, the DR can be executed by a connected thereto from the global Locator 1calLocator to network address translation, and global Locator is used for terminal communication global Locator DR connected thereto. 本发明不限定Locator的形式，仅以IP地址为例，说明具体的实施方式，即在实际应用中，local Locator 和global Locator 可以是IP 地址，local Locator 可以是私有IP地址，而global Locator则是公有IP地址。  The present invention is not limited in the form of Locator, the IP address as an example only, specific embodiments, i.e., in practical applications, and local Locator Locator global IP address may be, may be a private local Locator IP address, whereas the global Locator is a public IP address. 下面通过具体实施例进一步详细的描述面向用户的通信过程。  The user-oriented communication process will be described in further detail by specific examples. 310、第一域路由器接收第一终端发送的第一数据包，其中，第一数据包携带第一用户的用户标识和第二用户的用户标识，第一终端归属第一用户，第二终端归属第二用户。  310, a domain router first receives a first data packet sent by a first terminal, wherein the first user data packet carries a first identifier and a second user identifier of the user, a first user terminal belongs to the first, second two second user terminal belongs to. 320、利用第二用户的用户标识，查询第二终端连接的第二域路由器。  320, using the second user's user ID, query a second domain router connected to the second terminal. 可以理解，此时第一终端为源终端，第一用户为源用户，第二终端为目的终端，第二用户为目的用户；第一域路由器为第一终端在其当前域连接的域路由器；第二域路由器为第二终端在其当前所在域连接的域路由器。  It will be appreciated, when the first terminal is a source terminal, a source user a first user, the second terminal is a destination terminal, a second user for the purpose of a user; a first domain router to a first terminal connected to the current domain in which domain router; second domain router to a second terminal at its current domain router connected to the domain. 在实际应用中，例如若第一域路由器当前关联保存了第二用户的用户标识与第二域路由器的位置标识(即获知了第二终端归属的用户的用户标识与第二域路由器的位置标识关联关系)，则其可以在自身保存的关联信息中查询第二域路由器的位置标识。  In practical applications, for example, when the first domain router currently associated with the storage location identifier of the second identifier of the user of the second domain router (i.e., the second terminal belongs is known identifier of the user of the second domain router location identifier relationship), it can query the location identifier of the second domain router in the association information stored in itself. 例如若第一域路由器当前没有关联保存第二用户的用户标识与第二域路由器的位置标识(即没有获知第二终端归属的用户的用户标识与第二域路由器的位置标识关联关系)，则其可以向当前域的用户位置服务器查询第二域路由器的位置标识，当前域的用户位置服务器可以向第一域路由器反馈第二域路由器的位置标识。  For example, if the first domain router is not currently stored location identifier associated with the second user identifier of the second user domain router (i.e. not know the location identifier of the second terminal identifier of the user belongs to the second domain router association ), it can query the location identifier of the second domain router to the subscriber location server of the current domain, the domain of the current user location server may identify a second domain router feedback position to the first domain router. 在一种应用场景下，第一域路由器也可以向当前域的用户位置服务器查询第二域路由器的其它关联信息(例如域名信息等)，并根据当前域的用户位置服务器反馈的第二域路由器的关联信息，向与之关联的设备查询第二域路由器的位置标识。 In one application scenario, the first domain router can also query other associated information (e.g., name information, etc.) to a second user domain router current domain location server, location server and user feedback current domain a second domain router association information, the location identifier associated with a second domain router device queries. 在实际应用中，第二域路由器可以关联保存第二终端归属的用户的user ID和第二终端的Locator,即保存user ID和终端的Locator的关联关系。 Locator user ID and the second terminal of the user  In practical applications, the second domain router may associate and store the second terminal belongs, i.e., the stored relationship Locator user ID and a terminal. 在接收到第一数据包后，第二域路由器可以根据第一数据包携带的第二终端归属的用户的user ID,查询第二终端对应的Locator,并根据该Locator向第二终端发送第一数据包。 A second terminal  After receiving the first data packet, the second domain router may be carried in the first user data packet belongs user ID, a second terminal corresponding to the Locator inquiry, and to the second terminal based on the Locator transmitting a first data packet. 由上述技术方案可以看出，本发明实施例中基于用户标识模型，在网络中实现面向用户的通信；由于用户标识相对比较稳定，数据包的传输基于用户标识，通信可靠方便，有利于增强对用户移动性的支持，降低用户移动性管理的实现复杂度。  As can be seen from the above technical solutions, based on user identity model embodiment of the present embodiment of the invention, implement user-oriented communication network; relatively stable since the user identifier, for transmitting data packets based on user identity, reliable and convenient communication with help enhance support for user mobility and reduce implementation complexity of user mobility management. 进一步的，本发明实施例摒弃了传统的基于设备标识或基于地址的通信方式，有利于推进通信模式的演进和发展。  Further, embodiments of the present invention based on the device abandons the traditional identification or address-based communication system, the communication mode will help promote the evolution and development. 为便于理解，下面以用户A和用户B进行通信的过程为例，对本发明实施了面向用户的通信方法进行进一步详细的描述。  For ease of understanding, the following users A and B an example process of communication, of the embodiment of the present invention is a method of communication for a user is described in further detail. 本实施首先提供两种协议栈的实现方法和数据包的包头格式。  First, the present embodiment provides a method and implement two formats of data packet header stack. 其一种协议栈可以参见图4_a，即在现有通信协议栈的网络层(即IP层)和传输层之间在增加用户标识协议层(UIP, User ID Protocol)。  with a protocol stack may Referring to FIG 4_a, i.e. between the existing communication protocol stack network layer (i.e., IP layer) and the transport layer protocol level increase user identification (UIP, User ID Protocol). 其中，上述现有通信协议栈可以是符合开放系统互连(0SI，OpenSystemInterconnection)七层模型的协议栈；或者也可以是传输控制协议/英特网协议(TCP/IP,Transmission Control Protocol/Internet Protocol)协议栈，网络层即IP 层。  wherein the above-described conventional communication protocol stack may be in line with the Open Systems Interconnection (0SI, OpenSystemInterconnection) seven-layer protocol stack model; or may be a transmission control protocol / Internet protocol (TCP / IP, Transmission Control Protocol / Internet protocol) protocol stack, the network layer is the IP layer. 为便于描述，以下实施例均以TCP/IP协议栈为基础，说明本发明的具体实施方式。 For ease of description, the following examples are TCP / IP-based protocol stack, illustrate specific embodiments of the present invention. 在该方式下，通信双方交互的数据包的包头格式可以图4_a所示，包头包括UIP头和IP头，其中，UIP头包括源用户标识字段和目的用户标识字段；IP头包括源地址字段和目的地址字段。  In this way, both the header format of the communication packet can interact as shown in FIG. 4_a, including header and IP header UIP, wherein, UIP head includes a source user and a destination user identifier field identifier field; IP header includes a source address field and a destination address field. 其另一协议栈可以参见图4_b，即修改现有通信协议栈的网络层(即IP层)，利用网络层来承载UIP层的信息。  and the other protocol stack may Referring to FIG 4_b, i.e. modify existing communication protocol stack network layer (i.e., IP layer), using the network layer to carry information UIP layer. 在该方式下，通信双方交互的数据包的包头格式可以图4_b所示，增强现有的IP头，其中，该增强的IP头包括源用户标识字段和目的用户标识字段、源地址字段和目的地址字段。  In this way, both the header format of the communication packet may interact 4_b shown in FIG, enhance existing IP header, wherein the header includes a source IP enhanced user identification field and a destination user identification field, a source address field and a destination address field. 例如终端Ad归属用户A，终端Bd归属用户B。  Ad e.g. home subscriber terminal A, terminal Bd home subscriber B. 下面以基于上述两种协议栈的其中一种为例，介绍用户A的终端Ad和用户B的终端Bd交互数据包的过程。 Below an example based on one of the two protocol stacks, the process described terminal Ad and Bd terminal B of the user A user interaction data packet. 401、终端Ad向DRl发送数据包al。  401, the terminal transmits a data packet al Ad to DRl. 举例来说，用户A当前的用户标识为As，终端Ad当前分配到的位置标识为Aa (本地位置标识)；用户B当前的用户标识为Bs，终端Bd当前分配到的位置标识为Ba(本地位置标识)。  For example, the user A is the current user identifier As, Ad currently assigned to the terminal position identified as Aa (local location identifier); user B is identified as the current user of Bs, Bd currently assigned to the terminal position identified as Ba (local location identifier). 其中，通信双方发送的数据包的包头包括:源用户标识字段、目的用户标识字段、源地址字段、目的地址字段。  wherein both the header packet communication transmission comprises: a user identifier field source, destination user identification field, a source address field, a destination address field. 在一种应用场景下，终端Ad可以在数据包al包头的源用户标识字段携带As (源用户标识)、在其源地址字段携带Aa、在其目的用户标识字段携带Bs、若终端Ad当前还没有获知终端Bd当前连接的DR2的位置标识，则目的地址字段可以为空或携带无效信息。  In one application scenario, the terminal may be carried in Ad al packet header source user identifier field As (source user ID), which carries the source address field Aa, Bs in an object carrying a user identifier field, if terminal Ad currently no known location identifier Bd terminal DR2 of the current connection, the destination address field may be empty or carry invalid information. 特别的，终端Ad也可以不在数据包al包头的源地址字段携带Aa，而是设置为空或者携带无效信息。  In particular, the terminal may not Ad al packet header source address field carries Aa, but is set to empty or carry invalid information. 402、DR1根据数据包al包头的目的用户标识字段携带的用户B的用户标识Bs，查询终端Bd当前连接的域路由器DR2。  402, DR1 identifying the user data packet Bs al object header field carries a user identifier of the user B, the terminal queries DR2 Bd domain router currently connected. 在一种应用场景下，DRl可以利用其和终端Ad之间的连接，接收终端Ad发送的数据包al，并通过解析数据包al的包头，获得用户B的用户标识Bs (目的用户标识)。  In one application scenario, may be utilized DRl connection between its terminal and Ad, Ad terminal receives the data packet sent al, and by parsing the packet header al obtained user identification of Bs user B (user object logo). 其中，DRl当前若关联保存了用户B的用户标识Bs和DR2的位置标识(即保存了用户标识Bs和DR2的位置标识的关联关系)，则其可以根据用户B的用户标识Bs，在自身关联保存的关联信息中查询到DR2的位置标识。  wherein, DRl current when the associated saved User B's identity Bs and DR2 location identifier (i.e., to save the association between the user identifier Bs and location identifier of the DR2), it may identify Bs user user B, in association information stored in their associated queries to DR2 location identifier. DRl若未保存用户标识Bs和DR2的位置标识，DRl可以向用户A当前域的SLS发送查询请求消息，该查询请求消息携带用户B的用户标识Bs，以请求查询终端Bd连接的DR2的位置标识；用户A当前域的SLS同样可以根据用户B的用户标识Bs，在自身关联保存的关联信息中查询DR2的位置标识,并向DRl反馈查询到的DR2的位置标识。  DRl Bs and user identification if not stored location identifier DR2, DRl user A may be the current domain SLS Send request message, the query request message carries the user identifier of the user B Bs, DR2 query request to the terminal connection Bd location identifier; the SLS a user can also identify the current domain according to a user of the user B Bs, location identification query DR2 in the association information stored in association itself, to query the location identifier to feedback the DR2 DRl. 在实际应用中，为便于管理和查询用户和域路由器之间的关联关系，SLS可以维护一张关联映射表，其中，该关联映射表的记录可以包括用于记录用户的用户标识的字段，以及以下内容的至少一项:记录归属于该用户的终端当前连接的DR的位置标识的字段，记录终端的设备标识的字段、记录用户家乡域信息的字段、记录用户当前域信息的字段等。  In practice, for the association between the user and easy to manage and query domain router, SLS may maintain an association map, which records the association map may include a user for recording user identification field, and at least one of the following: location identifier field DR of the recording attributable to the user terminal currently connected, a terminal device identification field recording, the recording field of the user home domain information, domain information of the current field recorded user Wait. 在一种应用场景下，若用户A的当前域的SLS也没有在本地查找到与用户标识Bs相匹配的记录，则其可以利用用户标识Bs，直接向用户B的家乡域的SLS查询DR2的位置标识；或先向全局SLS查询用户B的家乡域信息，然后再向用户B的家乡域的SLS查询DR2的位置标识，并将获得的DR2的位置标识反馈给DRl。 SLS  In one application scenario, SLS if the current domain does not find the user A to the user identification record matches Bs locally, it can use a user identifier Bs, directly to the user's home domain B DR2 location identifier of the query; SLS or Xianxiang global query the home domain information of the user B, and then to the SLS in the home domain of the user B queries the location identifier of the DR2 and DR2 location identifier of the obtained feedback to DRl. 特别的，若用户B当前处于漫游状态，即用户B的当前域和家乡域是不同的域，且用户B的家乡域的SLS也没有在本地查找到与用户标识Bs相匹配的记录，则用户B的家乡域的SLS可以进一步向用户B的当前域的SLS查询DR2的位置标识，并将获得的DR2的位置标识逐级反馈给DRl。  In particular, if the user B is currently in a roaming state, i.e., the current domain and the home domain of the user B are different domains, and SLS in the home domain of the user B does not find the record identifier and a user Bs matched locally , the SLS in the home domain of the user B can further inquiries to identify the location of the SLS DR2 current domain user B, and DR2 location identifier obtained step by step back to DRl. 需要说明的是，若DRl和DR2位于同一个域中，则DRl获取的DR2的位置标识可以是本地位置标识(local Locator);若DRl和DR2位于不同域中，则DRl获取的DR2的位置标识可以是全局位置标识(global Locator)。  Incidentally, if the location identification DRl and DR2 in the same domain, DRl and DR2 acquired location identifier may be a local (local Locator); DR2 if DRl and DR2 in different domains, the acquired DRl the location identifier may be a global location identification (global Locator). 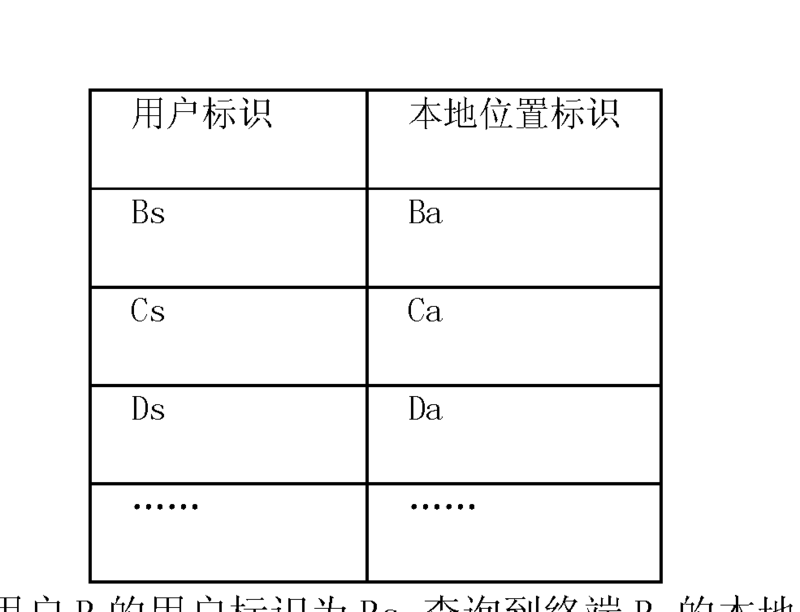 本实例以DRl和DR2位于不同域为例，进行说明。 In the present example DRl and DR2 in different domains, for example, will be described. 在另一种应用场景下，DRl也可以向当前域的用户位置服务器查询DR2的其它关联信息(例如域名信息等)，并根据当前域的用户位置服务器反馈的DR2的关联信息，向与之关联的设备(例如DNS)查询第二域路由器的位置标识，进行后续流程。  In another application scenario, DRl also query the other associated information (e.g., name information, etc.) to the subscriber location server DR2 current domain, and link information based on the user location server DR2 feedback of the current domain, the devices (e.g., DNS) query associated with a second location identifier of the domain router, the subsequent process. 403、DRl根据DR2的位置标识，向DR2发送数据包al。  403, DRl DR2 according to the location identifier, to send a packet DR2 al. 举例来说，若DRl当前分配到的全局位置标识为Rlgs，DR2当前分配到的全局位置标识为R2gs。  For example, if the currently assigned to DRl global location identifier is Rlgs, DR2 currently assigned to the global location identifier is R2gs. 在一种应用场景下，DRl在获得DR2的位置标识后，将数据包al包头部分的源地址字段携带的源地址(Aa)替换为DRl的全局位置标识Rlgs，在其目的地址字段携带DR2的全局位置标识R2gs。  In one application scenario, DRl DR2 after obtaining the location identifier, the source address field of the packet header portion al is carried in the source address (Aa) is replaced with the global location identifier Rlgs DRl, on which a destination address field to carry the global location identifier of R2gs DR2. DRl向DR2发送修改了包头的数据包al。  DRl transmitting the modified data packet header to al DR2. DRl执行了local Locator到globalLocator 的转换。 DRl implementation of the local Locator to globalLocator conversion. 404、DR2向终端Bd发送数据包al。  404, DR2 send packets to the terminal al Bd. 在一种应用场景下，DR2接收到DRl发送的上述修改了包头的数据包al后，可以进一步解析接收到的数据包al的包头，获得包头携带的用户B的用户标识为Bs。 After  In one application scenario, DR2 of receiving the header of the modified data packet transmitted DRl al, may further parse the received data packet header al., Header carries the user to obtain the user B identified as Bs. 在实际应用中，为便于管理和查询，DR可以维护一张路由映射表，该路由映射表的记录可以包括:用于记录用户的用户标识的字段和记录归属于该用户的终端的本地位置标识(local Locator)的字段等。  In practice, for ease of management and query, the DR may maintain a routing map, the routing map records may include: a field for recording and identifier of the user's home to the user terminal local location identifier (local Locator) field and the like. DR2可以根据用户B的用户标识为Bs，查询到终端Bd的本地位置标识Ba。  DR2 according to the user identifier of the user B Bs, the terminal queries the home location identifier Bd Ba. DR2可以将数据包al包头的目的地址字段携带的R2gs替换为终端Bd的本地位置标识Ba，并向终端Bd发送修改了包头的数据包al。 DR2 al packet header destination address field carries R2gs Ba may be replaced with the terminal identifier of the home location Bd, Bd sent to the terminal to modify the packet header al. 可以理解，此时DR2向终端Bd发送的数据包al的包头的源用户标识字段携带的是用户A的用户标识As、源地址字段携带的是DRl的位置信息、目的用户标识字段携带的是用户B的用户标识Bs、目的地址字段携带的是终端Bd的本地位置标识Ba。  It will be appreciated, this time of DR2 al packet transmitted to the source user terminal Bd header identification field carries the user identifier of the user A As, carried in the source address field of DRl position information, destination user identity field carries user B is a user identifier Bs, it is carried in the destination address field of the local location identifier Bd terminal Ba. DR2执行了globalLocator 至Ij local Locator 的转换。 DR2 performed globalLocator to Ij local Locator conversion. 特别的，DR2也可以不对数据包al包头进行修改，而是直接将其发送给终端Bd。  In particular, DR2 of the data packet can not be modified al header, but directly transmits it to the terminal Bd. 405、终端Bd向DR2发送数据包a2。  405, the terminal transmits a data packet Bd a2 to DR2. 其中，终端Bd接收到数据包al后，可以通过解析数据包al的包头，获得DRl的全局位置标识Rlgs和用户A的用户标识As。 After  wherein the terminal receiving the data packet al Bd, by parsing the packet header al., Global access to the user DRl location identifier identifying the user A and Rlgs As. 若需要，终端Bd可以向DR2发送数据包a2，其中，终端Ad可以在数据包a2包头的源用户标识字段携带用户B的用户标识Bs、在其源地址字段携带终端Bd的本地位置标识Ba、在其目的用户标识字段携带As、在其目的地址字段携带DRl的全局位置标识Rigs。  If desired, the terminal Bd can send data packets a2 to DR2 of, wherein the terminal Ad may carry User B's identity Bs in the packet a2 header source user identity field carries the local position of the terminal Bd in its source address field identification Ba, in which the destination user identity field carries As, carrying Rigs DRl global location identifier in a destination address field thereof. 406、DR2 向DRl 发送数据包a2。  406, DR2 to send packets a2 DRl. 在一种应用场景下，DR2可以将数据包a2包头部分的源地址字段携带的源地址(Ba)替换为DR2的全局位置标识R2gs，并向DR2发送修改包头后的数据包a2。  In one application scenario, the packet may a2 DR2 of the source address field of the header portion carrying a source address (Ba) replaced R2gs DR2 global location identifier, and send the modified data packet header a2 DR2. DR2执行了local Locator 到global Locator 的转换。 DR2 implementation of the local Locator to global Locator conversion. 407、DRl向终端Ad发送数据包a2。  407, DRl Ad send packets to the terminal a2. 在一种应用场景下，DRl可以将数据包a2包头部分的目的地址字段携带的DRl的全局位置标识Rlgs替换为终端Ad的本地位置标识Aa，并向终端Ad发送修改包头后的数据句I a2。  In one application scenario, the packet may a2 DRl destination address field of a header portion carried DRl global location data identifying Rlgs replacement location identifier for the terminating local Ad Aa, and to modify terminal transmits header Ad sentence I a2. DR I 执行了local Locator 到global Locator 的转换。  DR I performed the local Locator to global Locator conversion. [0141 ] 终端Ad接收到数据包a2后，可以解析数据包a2的包头，获得DR2的全局位置标识R2gs。 After  Ad terminal receiving the data packet a2, a2 ​​can parse the packet header to obtain the global position identification R2gs DR2. 至此，通信双方(终端Ad和终端Bd)均获知了对端DR的全局位置标识，终端Ad和终端Bd可以直接通过DRl和DR2进行通信，终端Ad和终端Bd后续交互的数据包的目的地址字段可携带对端DR的全局位置标识。 At this point, the communication parties (terminal Ad and terminal Bd) are informed of the global location identifier end DR, the terminal Ad and the terminal Bd may be a destination address field of the data packet subsequent interactive communication terminal Ad and the terminal Bd directly DRl and DR2 portable global location identifier of the peer DR.
 需要说明的是，本实例是以终端Ad和终端Bd连接到不同的DR为例进行举例说明的，若终端Ad和终端Bd连接同一个DR，则该DR可以转发终端Ad和终端Bd之间交互的数据包。  Incidentally, the present example is a terminal Ad and Bd are connected to different terminal DR illustrated example, if the terminal Ad and Bd are connected with a DR terminal, the terminal may be forwarded DR Ad and Bd terminal interaction between packets. 由上述技术方案可以看出，本实施例中基于用户标识模型，在网络中实现面向用户的通信；由于用户标识相对比较稳定，数据包的传输基于用户标识，通信变得可靠方便，同时有利于增强对用户移动性的支持，降低用户移动性管理的实现复杂度。  As can be seen from the above technical solutions, based on user identity model in the present embodiment, implement user-oriented communication network; relatively stable since the user identifier, for transmitting data packets based on user identity, the communication becomes reliable and easy, It is also conducive to enhanced support for user mobility and reduce implementation complexity of user mobility management. 进一步的，通信过程对丽需求相对较少，空口消耗相对较少；通信过程中终端的数据处理负荷相对较低，有利于降低终端的软硬件配置，降低成本。  Further, communications through Chengdui Li demand is relatively small, a relatively small consumption of air interface; data processing load is relatively low during the communication terminal, terminal hardware and software configurations help to reduce the cost reduction. 本实施例中主要说明DR和SLS路由信息的更新过程。  In the present embodiment, the main process described update routing information DR and SLS. 其中，以用户A的终端〜通过接入网(AN，ACCesS Network)连接到DR1，并进行路由信息注册的过程为例，进行详细描述。 Wherein the user A to the terminal - is connected through the access network (AN, ACCesS Network) to DR1, and routing information registration process as an example, it is described in detail. 501、终端Ad向DRl发送路由注册消息。  501, Ad registered terminal sends a routing message to DRl. 在一种应用场景下，终端Ad可以在预设的路由注册事件发生时，发起路由信息注册的流程。  In an application scenario, the terminal can be preset Ad route registration event occurs, initiating the process of registering routing information. c、终端Ad新建一个连接，新连接的DR为DRl。  c, Ad new connection terminal, DR new connection is DRl. 在实际应用中，终端Ad发送的上述路由注册消息可以携带用户A的用户标识As和终端Ad的设备标识Adid。  In practical applications, the above route registration message sent by the terminal may carry Ad A user user identity and terminal equipment identifier Adid As the Ad. 可选的，上述路由注册消息可以途经接入网中的网关或其它网关，由该网关将该路由注册消息转发给DR1。  Optionally, the registration message may be routed via an access network gateway or other gateways, the route registered by the gateway forwards the message to DR1. 当然，终端Ad也可以利用其它消息向DRl上报User ID和device ID。  Of course, the terminal may use other Ad report message to the User ID and device ID DRl. 例如，终端Ad可以在获取IP地址的DHCP (Dynamic Host Configuration Protocol,动态主机配置协议)消息、MIP (Mobile Internet Protocol,移动IP)注册消息、或BU(Binding Update,绑定更新)消息等等消息中携带上述两项标识。 For example, the terminal may be a message in Ad DHCP (Dynamic Host Configuration Protocol, Dynamic Host Configuration Protocol) to obtain an IP address, MIP (Mobile Internet Protocol, mobile IP) registration message, or BU (Binding Update, the Binding Update) message, etc. Message These two carries identification. 或者，DRl也可以从其它网元获取上述User ID和device ID，例如在终端Ad的入网鉴权过程中，从归属用户服务器(HSS,Home Subscriber Server)或鉴权授权计费(AAA,Authentication Authorization Accounting)服务器获得上述两项标识。  Alternatively, DRl may be the User ID and acquires the device ID from another network element, for example, network access authentication process in the Ad terminal, from the home subscriber server (HSS, Home Subscriber Server) or Authentication Authorization Accounting (AAA , Authentication Authorization Accounting) server to obtain the above identified two. 可以理解，在从其他网元获取User ID和device ID的场景下，步骤501可以省略，DRl可以直接发起后续路由注册的步骤。 It will be appreciated, in the User ID and the device ID acquired from the other network elements of the scene, step 501 may be omitted, DRl subsequent routing steps can be initiated directly registered. 502、DRl关联保存用户标识As和设备标识Adid,并为终端Ad分配本地位置标识(local Locator)。  502, DRl associated stored user identifier and device identifier As Adid, and allocate a local location identifier (local Locator) to the terminal Ad. 可选的，例如也可以由网关在接收到终端Ad发送的路由注册消息后，为终端Ad分配local Locator,并将分配的local Locator携带在路由注册消息中发送给DRl ；DR1则可以直接关联保存路由注册消息中携带的用户标识As、设备标识Adid以及网关为终端〜分配的local Locator。 After  Alternatively, for example, may be routed by the gateway receiving the registration message sent by the terminal Ad, Ad assigned local Locator terminal, the allocated local Locator carried to a registration message routing DRl; DRl can save directly associated route registration message carries a user identifier as, and a gateway device identification Adid local Locator is assigned to the terminal ~. 503, DRl向当前域的SLS发送路由注册消息。  503, DRl SLS transmission route registration message to the current domain. 在一种应用场景下，DRl发送的路由注册消息可以携带用户标识As、设备标识Adid以及DRl的global Locator等。  In one application scenario, DRl route registration message carries the user identifier may be sent As, device identification Adid global Locator DRl and the like. DRl当然也可以利用其它消息向当前域的SLS上报UserID、device ID 以及DRl 的global Locator 等。 DRl course, other messages may also be used to report the UserID SLS current domain, device ID and global Locator DRl the like. 504、当前域的SLS关联保存DRl上报的User ID、device ID以及DRl的globalLocator 等。  504, associated with the current domain SLS stored DRl reported by User ID, device ID and the DRl globalLocator like. 在实际应用中，当前域的SLS在接收到DRl发送的路由注册消息后，可以解析该路由注册消息，从该路由注册消息获取User ID、device ID、DR1的globalLocator等等信息。 After  In practice, SLS current domain route in the received registration message sent DRl, the route registration message can be parsed, User ID acquired from the registration message routing, device ID, DR1 of globalLocator so forth. 其中，若SLS维护有关联映射表，则其可以将DRl上报的User ID,device ID以及DRl的global Locator等信息作为一条记录,添加到其维护的关联映射表中，以便管理和查询。  wherein, if the SLS maintains association map, it may be DRl reported by the User ID, device ID and global Locator DRl information such as a record, is added to the association map their maintenance in order to manage and query . 可选的，当前域的SLS可以向DRl发送路由注册响应消息。  Alternatively, the current domain may SLS DRl registration response message to the transmission route. 505、DRl向终端Ad发送路由注册响应消息，其中携带为终端Ad分配的1calLocator 等。  505, DRl Ad registered in response to the terminal sends a routing message carrying the terminal assigned to Ad 1calLocator like. 可选的，DRl向终端Ad发送的上述路由注册响应消息，可以经由网关向终端、转发。  Optionally, the route DRl Ad sent to the terminal registration response message, the terminal may be forwarded via the gateway. 终端Ad则接收并解析DRl发送的上述路由注册响应消息，获得为终端Ad分配的local Locator 等。  Ad terminal is receiving and analyzing the routing DRl transmitted registration response message, the terminal obtained as Ad allocated local Locator like. 需要说明的是，若用户A当前处于漫游状态，即终端Ad的当前域为其拜访域，此时，当前域的SLS可以进一步向终端Ad家乡域(Home Domain)的SLS进行路由信息注册。  Incidentally, if the user A is currently in a roaming state, i.e., its current domain Ad terminal visited domain, this time, the current domain SLS may further routing information to the home Ad SLS terminal domain (Home Domain) of registered. 601、当前域的SLS向家乡域的SLS发送路由注册消息。  601, SLS current domain SLS sends a route registration message to the home domain. 其中，上述路由注册消息可以携带用户标识As、设备标识Adid以及DRl的globalLocator等，或者上述路由注册消息也可以携带用户标识As、设备标识Adid以及DRl的当前域(即用户A的拜访域)的域信息(例如，域标识、域编号等等域识别信息)。  wherein said route registration message may carry a user identifier As, device identification Adid and DRl of globalLocator the like, or the above-described route registration message may also carry a user identifier As, device identification Adid and DRl current domain (i.e., visited user A domain) domain information (e.g., domain identifier, a domain ID the domain identification information and the like). 602、家乡域的SLS关联保存上述路由注册消息携带的信息。  602, associated home domain SLS register stores the routing information carried in the message. 在实际应用中，家乡域的SLS在接收到当前域的SLS发送的路由注册消息后，可以解析该路由注册消息，获得其携带的User ID、device ID以及DRl的global Locator等，或者获得其携带的User ID、device ID以及拜访域的域信息等。 After  In practice, SLS home domain receiving the route registration message SLS transmitted in the current domain, you can resolve the route registration message, User ID assigned it carries, device ID and global Locator DRl the like, or obtain a User ID, device ID domain information they carry and visited domain. 其中，若家乡域的SLS维护有关联映射表，则其可以将当前域的SLS上报的UserID、device ID 以及DRl 的global Locator,或者将当前域的SLS 上报的UserID、device ID以及拜访域的域信息等作为一条记录，添加到其维护的关联映射表中，以便管理和查询。  wherein, if the SLS home domain maintains the association map, it may be SLS current domain reported UserID, SLS global Locator device ID and DRl, or the current domain reported UserID, device ID and visit domain information domain as a record, adding to its association mapping table maintained in order to manage and query. 可以理解，家乡域的SLS关联保存上述信息，可以方便后续其它设备向其查询用户A的路由信息。  It will be appreciated, associated with SLS in the home domain stores the information, the routing information can easily follow other devices to which the user A's queries. 其中，若家乡域的SLS关联保存的是User ID、device ID以及用户A拜访域的域信息，当其它设备向其查询用户A的路由信息时，家乡域的SLS可以先根据用户A拜访域的域信息，向拜访域的SLS查询DRl的位置标识，然后再反馈给请求查询用户A的路由信息的相应设备。 Wherein, when the stored SLS is associated with the home domain User ID, device ID and a user information field A visited domain, when the route information of other devices to which the user A's query, SLS home domain to the visited domain can be according to user A domain information, the query to the location identifier DRl SLS visited domain, and then back to the user a query requesting routing information corresponding device. 603、可选的，家乡域的SLS向当前域的SLS发送路由注册响应消息。  603, an optional, SLS home domain registration SLS sends a route response message to the current domain. 至此，拜访域的SLS向家乡域的SLS发起的路由信息注册的过程结束。  Thus, the end of the field visit to the SLS launch SLS in the home domain routing information registration process. 由上可见，本实施例通过用户路由信息的注册，域路由器和用户位置服务器关联保存用户的相关路由信息，有利于后续通信的顺畅进行。  seen from the above, this embodiment, register the relevant routing information, the routing information associated with the user domain router and the server saves the user the user's location, facilitate subsequent communication is smooth. 为便于更好的实施本发明实施例的技术方案，本发明实施例中还提供一种域路由器。  For better implementation of the technical solutions of the embodiments of the present invention, the present invention provides a further embodiment of the domain router. 参见图7、本发明实施例四的一种域路由器700可以包括接收模块710、查询模块720和发送模块730。  Referring to Figure 7, the present invention is to implement a fourth embodiment domain router 700 may include a receiving module 710, query module 720 and a sending module 730. 其中，接收模块710，用于接收第一终端发送的第一数据包，其中，第一数据包携带第一用户的用户标识和第二用户的用户标识，第一终端归属第一用户，第二终端归属第二用户。  wherein, the receiving module 710, for receiving a first data packet sent by a first terminal, wherein the first user data packet carries a first user identifier and a second identifier of the user, a first user terminal belongs to a first , a second terminal belongs to a second user. 查询模块720，用于利用第二用户的用户标识，查询第二终端连接的第二域路由器。  Query module 720, a user identifier of the second user, the second query domain router connected to the second terminal. 发送模块730，用于向第二域路由器发送第一数据包，以便于第二域路由器将第一数据包发送给第二终端。  The sending module 730, configured to send a first data packet to a second domain router, to the first data packet to a second terminal to the second domain router. 其中，上述的用户标识，可位于协议栈中网络层与传输层之间新增的用户标识协议层，也可位于修改后的网络层中。  wherein said user identification, the protocol stack may be located between the new network and transport layers of the protocol layer a user identifier, the network layer may be located after the modification. 在一种应用场景下，若域路由器700当前关联保存了第二终端归属的用户的用户标识与第二域路由器的位置标识(即获知了第二终端归属的用户的用户标识与第二域路由器的位置标识关联关系)，则查询模块720可以在域路由器700关联保存的信息中查询第二域路由器的位置标识。  In one application scenario, if the domain router 700 is currently associated with the storage location identifier of the second terminal identifier of the user belongs to the second domain router (i.e., the user ID is known and the second terminal of the second user's home location identifier relationship two domain router), the location identifier of the second query module 720 can query the domain router 700 associated with information stored in the domain router. 在一种应用场景下，查询模块720可以包括:第一发送子模块和接收获得子模块。  In one application scenario, query module 720 may include: a first sending sub-module and the receiving sub-module is obtained. 其中，第一发送子模块，用于向当前域的用户位置服务器发送携带第二用户的用户标识的消息，请求查询第二终端连接的第二域路由器的位置标识。  The first sending sub-module, configured to send to the subscriber location server a message carrying the current domain user identification of the second user, a second request to query the domain router connected to the second terminal location identifier. 接收获得子模块，用于接收当前域的用户位置服务器发送的携带第二域路由器的位置标识的消息，获得第二域路由器的位置标识。  receiving sub-module is obtained, a message carrying the location identifier of the second domain router receiving the current domain server sends user position, the position identifier of the second domain router. 其中，当前域的用户位置服务器在接收到携带第二用户的用户标识的消息后，可以解析该消息，获得第二用户的用户标识；并利用第二用户的用户标识，查询第二终端连接的第二域路由器的位置标识，并向域路由器700反馈第二域路由器的位置标识。  wherein the subscriber location server of the current domain after receiving the message carrying the user identification of the second user, the message can be parsed, obtain a second identifier of the user; and the user identifier of the second user, the second query the position of the terminal identifier of the second domain router connected to the domain router 700 identifies the position of the second feedback domain router. 在一种应用场景下，接收模块710接收的第一数据包的包头包括:源用户标识字段和目的用户标识字段、源地址字段和目的地址字段，其中，上述源用户标识字段携带第一用户的用户标识，上述目的用户标识字段携带第二用户的用户标识。  In one application scenario, a first receiving module 710 receives the data packet header comprising: a source user and a destination user identification field identification field, a source address field and a destination address field, wherein the user identity field carries the source of a user's user ID, user ID field carries the above-described second object identifier of the user. 发送模块730可以包括:包头修改子模块和第二发送子模块。  730 may transmit module comprising: a sub-header modification module and a second sending sub-module. 其中，包头修改子模块，用于在第一数据包包头的源地址字段携带第一域路由器的位置标识，目的地址字段携带第二域路由器的位置标识，获得修改包头的第一数据包。  wherein the sub-header modification module configured to identify the location in the source address field of the first packet header carries a first domain router, the destination address field carries the location identifier of the second domain router, the first data obtained modified header package. 第二发送子模块，用于向第二域路由器发送包头修改子模块修改包头的第一数据包。  The second sending sub-module, configured to send a second sub-domain router packet header modification module modifies a first packet header. 在实际应用中，第二域路由器可以关联保存第二用户的user ID和第二终端的Locator,即保存user ID和终端Locator的关联关系。  In practical applications, the second domain router may associate and store the user ID and the user of the second terminal of the second Locator, i.e. stored user ID and the terminal association of Locator. 可以理解是的，本实施例的域路由器700可以如上述方法实施例中的域路由器，其各个功能模块的功能可以根据上述方法实施例中的方法具体实现，其具体实现过程可参照上述实施例中的相关描述，此处不再赘述。  It will be appreciated Yes domain router according to the present embodiment 700 domain router embodiment may be implemented as the method described above, the specific method embodiments the functions of each functional block may be implemented in accordance with the method described above, the specific implementation process, reference may Examples of the above-described embodiments related description is not repeated here. 参见图8、本发明实施例五的一种域路由器800可以包括接收模块810、查询模块820和发送模块830。 One kind of domain router  Referring to Figure 8, according to a fifth embodiment 800 of the present invention may include a receiving module 810, query module 820 and a sending module 830. 其中，接收模块810，用于接收第一数据包，其中，第一数据包携带第一用户的用户标识和第二用户的用户标识，第二终端归属第二用户。  wherein, the receiving module 810, configured to receive a first data packet, wherein the first user data packet carries a first user identifier and a user identifier of the second user, the second terminal belongs to a second user. 查询模块820，用于利用第二用户的用户标识，查询第二终端的本地位置标识。  Query module 820, a user identifier of the second user, query the home location identifier of the second terminal. 端发送第一数据包。 Sends a first data packet. 可以理解是的，本实施例的域路由器800可以如上述方法实施例中的域路由器，其各个功能模块的功能可以根据上述方法实施例中的方法具体实现，其具体实现过程可参照上述实施例中的相关描述，此处不再赘述。  It will be appreciated Yes domain router according to the present embodiment 800 domain router embodiment may be implemented as the method described above, the specific method embodiment in its function of each functional module may be implemented in accordance with the method described above, the specific implementation process, reference may Examples of the above-described embodiments related description is not repeated here. 为便于更好的实施本发明实施例的技术方案，本发明实施例中还提供一种域路由器。  For better implementation of the technical solutions of the embodiments of the present invention, the present invention provides a further embodiment of the domain router. 参见图9、本发明实施例六的一种域路由器900可以包括接收模块910、包头修改模块920和发送模块930。  Referring to Figure 9, the present invention embodiment of a domain router 900 may comprise six receiving module 910, header modification module 920 and a sending module 930. 其中，接收模块910，用于接收第二终端发送的第一数据包，其中，第一数据包的包头携带第一用户的用户标识、第二用户的用户标识以及第一终端连接的第一域路由器的位置标识，第一终端归属第一用户，第二终端归属第二用户。  wherein, the receiving module 910, configured to receive a first data packet sent by the second terminal, wherein the first user data packet header carries a first user identifier, the user identifier and the second user terminal connected to a first location identifier of the first domain router, the first terminal belongs to a first user, a second terminal belongs to a second user. 包头修改模块920，用于修改第一数据包的包头，其中，修改后的第一数据包的包头携带第一用户的用户标识、第二用户的用户标识、第一终端连接的第一域路由器的位置标识以及第二域路由器的位置标识。  header modification module 920 for modifying a first data packet header, wherein the header of the first packet of a first modified user carries the user identifier, the user identifier of the second user, connected to a first terminal domain router a location identifier and a location identifier of the second domain router. 发送模块930，用于向第一域路由器发送包头修改模块920修改包头的第一数据包。  sending module 930, configured to send a first domain router first header modification module 920 to modify the data packet header. 在实际应用中，第一域路由器可以关联保存第一用户的user ID和第一终端的Locator,即保存user ID和终端Locator的关联关系。  In practical applications, the first domain router saved user ID may be associated with a first terminal of the first user and a Locator, i.e. stored user ID and the terminal association of Locator. 在接收到第一数据包后，第一域路由器可以根据第一数据包携带的第一用户的user ID,查询第一终端对应的Locator,并根据该Locator向第一终端发送第一数据包。  After receiving the first data packet may carry a first domain router according to the first user data packet of the first user ID, a first query Locator corresponding to the terminal, and transmits to the first terminal based on the first Locator data pack. 可以理解是的，本实施例的域路由器900可以如上述方法实施例中的域路由器，其各个功能模块的功能可以根据上述方法实施例中的方法具体实现，其具体实现过程可参照上述实施例中的相关描述，此处不再赘述。  It will be appreciated Yes, the domain router 900 embodiment domain router embodiment may be implemented as the method described above, the specific method embodiments the functions of each functional block may be implemented in accordance with the method described above, the specific implementation process, reference may Examples of the above-described embodiments related description is not repeated here. 参见图10、本发明实施例七的一种域路由器1000可以包括:接收模块1010、分配保存模块1020、发送模块1030。  Referring to FIG. 10 A domain router according to a seventh embodiment of the present invention 1000 may comprise: a receiving module 1010, storage module 1020 assigned, transmission module 1030. 中,第一终端归属第一用户。 , The first terminal belongs to the first user. 在一种应用场景下，获取模块1010可以通过多种方式获取第一终端的设备标识和第一用户的用户标识，例如可以接收携带第一终端的设备标识和第一用户的用户标识的消息，从该消息中获取到第一终端的设备标识和第一用户的用户标识。  In one application scenario, obtaining module 1010 may obtain the device identifier of the first user terminal and a first user identification number of ways, for example, receive a first carrying device identifier and the first terminal identifier of the user message, obtain the message from the first terminal to the device identifier and the user identifier of the first user. 发送模块1020，用于向当前域的用户位置服务器发送路由注册消息，该路由注册消息携带第一终端的设备标识、第一用户的用户标识以及第一域路由器的关联信息。  The sending module 1020 is configured to send to the subscriber location server routes the current domain registration message, the route registration message carries the identifier of the first terminal apparatus, information associated with a first user and a first user identifier of the domain router. 分配模块1030，用于为第一终端分配本地位置标识。  allocation module 1030, a first terminal is assigned to the local location identifier. 第二发送模块，用于向第一终端发送携带分配模块1030为第一终端分配本地位置标识的消息，将第一终端的本地位置标识通知给第一终端。  The second sending module, configured to send a first end carrying a first allocation module 1030 assigned to the terminal of the message to the local location identifier, the location identifier of the first local terminal notifies the first terminal. 在一种应用场景下，域路由器1000还可以包括: 保存模块1040，用于关联保存第一终端的本地位置标识和第一用户的用户标识(即保存第一终端的本地位置标识和第一用户的用户标识的关联关系)。  In one application scenario, the domain router 1000 may further comprise:  1040 storage module configured to associate and store the first local terminal identifier and a first location identifier of the user (i.e., storing the first terminal of the local a first location identifier and association identifier of the user's). 保存模块1040可以直接关联保存第一用户的用户标识和网关或网络中的其它设备为第一终端分配的本地位置标识。  storing module 1040 may be directly associated with a local storage location identifier of the first user's user ID and the gateway or other network devices assigned to the first terminal. 可以理解是的，本实施例的域路由器1000可以如上述方法实施例中的域路由器，其各个功能模块的功能可以根据上述方法实施例中的方法具体实现，其具体实现过程可参照上述实施例中的相关描述，此处不再赘述。  It will be appreciated Yes domain router according to the present embodiment is 1000 domain router embodiment may be implemented as the method described above, the specific method embodiment in its function of each functional module may be implemented in accordance with the method described above, the specific implementation process, reference may Examples of the above-described embodiments related description is not repeated here. 参见图11、本发明实施例八的一种域路由器1100可以包括:接收模块1110、分配保存模块1120、发送模块1130。  Referring to Figure 11, the eighth embodiment of the present invention is a domain router 1100 may include: a receiving module 1110, storage module 1120 assigned, transmission module 1130. 其中，接收模块1110，用于接收第一终端发送的第一数据包，其中，第一数据包携带第一用户的用户标识和第二用户的用户标识，第一终端归属第一用户，第二终端归属第二用户。  wherein, the receiving module 1110, a first terminal for receiving a first data packet transmission, wherein the first user data packet carries a first user identifier and a user identifier of the second user, the first user terminal belongs to a first , a second terminal belongs to a second user. 其中，第一终端和第二终端都连接到域路由器1100。  wherein the first and second terminals are connected to the domain router 1100. 查询模块1120，用于利用第二用户的用户标识，查询第二终端的本地位置标识。  Query module 1120, a user identifier of the second user, query the home location identifier of the second terminal. 发送模块1130，用于根据第二终端的本地位置标识，向第二终端发送第一数据包。  sending module 1130, according to the local location identifier for the second terminal, transmitting a first data packet to the second terminal. 可以理解是的，本实施例的域路由器1100可以如上述方法实施例中的域路由器，其各个功能模块的功能可以根据上述方法实施例中的方法具体实现，其具体实现过程可参照上述实施例中的相关描述，此处不再赘述。  It will be appreciated Yes domain router 1100 embodiment domain router embodiment may be implemented as the method described above, the specific method embodiments the functions of each functional block may be implemented in accordance with the method described above, the specific implementation process, reference may Examples of the above-described embodiments related description is not repeated here. 为便于更好的实施本发明实施例的技术方案，本发明实施例中还提供一种用户位置服务器。  For better implementation of the technical solutions of the embodiments of the present invention, the present invention provides a further embodiment of the subscriber location server. 参见图12、本发明实施例九的一种用户位置服务器1200可以包括:接收模块1210、解析获得模块1220和关联保存模块1230。  Referring to Figure 12, a user-location server according to a ninth embodiment of the present invention may comprise 1200: a receiving module 1210, a parse module 1220 obtaining module 1230 and an associated storage. 其中，接收模块1210，用于接收第一路由注册消息，其中，第一路由注册消息携带第一终端的设备标识、第一用户的用户标识和第一域路由器的关联信息，第一终端归属第一用户。  wherein, the receiving module 1210 for receiving a first route registration message, wherein the first registration message carries routing identifier of the first terminal apparatus, information associated with a first user of a first user identifier and the domain router, the first The first user terminal belongs to. 在一种应用场景下，上述的第一域路由器的关联信息可以是:第一域路由器的位置标识、第一域路由器的域名或者其它能够与之关联的信息。  In one application scenario, the above-described association information of the first domain router may be: identifying a first location of the domain router, the first domain router in the domain name or other information can be associated. 获取模块1220、用于从接收模块1210接收的第一路由注册消息获取第一终端的设备标识、第一用户的用户标识以及第一域路由器的位置标识。  obtaining module 1220, configured to obtain the position of a first terminal identifier of the identification device, a first user and a first user identifier from a domain router first receiving module 1210 receives the registration message routing. 关联保存模块1230，用于关联保存获取模块1220获取的第一终端的设备标识、第一用户的用户标识以及第一域路由器的关联信息。 A first terminal device identifier  associated storage module 1230 configured to associate and store acquisition module 1220 acquires the related information of the first user and the first user identifier of the domain router. 可以理解是的，本实施例的用户位置服务器1200可以如上述方法实施例中的用户位置服务器，其各个功能模块的功能可以根据上述方法实施例中的方法具体实现，其具体实现过程可参照上述实施例中的相关描述，此处不再赘述。  It will be appreciated a user location server according to the present embodiment 1200 Examples subscriber location server can be implemented as the method described above, the specific method embodiment in its function of each functional module may be implemented in accordance with the method described above, the specific implementation process It can refer to the above-described embodiments related description is not repeated here. 参见图13、本发明实施例十的一种用户位置服务器1300可以包括:接收模块1310、查询模块1320和发送模块1330。  Referring to Figure 13, the tenth embodiment of the present invention a subscriber location server 1300 may include: a receiving module 1310, a query module 1320 and transmission module 1330. 其中，接收模块1310，用于接收第一域路由器发送的查询请求消息，该查询请求消息携带第二终端归属的用户的用户标识。  wherein, the receiving module 1310, a router for receiving a query request message sent by the first domain, the query request message carries a second terminal identifier of the user belongs. 查询模块1320，用于根据第二终端归属的用户的用户标识，查找第二终端连接的第二域路由器的位置标识。  Query module 1320, according to a second terminal identifier of the user belongs, to find a second domain router connected to the second terminal location identifier. 发送模块1330，用于向第一域路由器发送查询响应消息，该查询响应消息携带第二域路由器的位置标识，以便于第一域路由器根据第二域路由器的位置标识，向第二域路由器发送数据包。  sending module 1330, configured to send a query response message to the first domain router, the query response message carries the location identifier of the second domain router, so that the first domain router according to the location identifier of the second domain router, the second domain router sends packets. 可以理解是的，本实施例的用户位置服务器1300可以如上述方法实施例中的域路由器，其各个功能模块的功能可以根据上述方法实施例中的方法具体实现，其具体实现过程可参照上述实施例中的相关描述，此处不再赘述。  It will be appreciated a user location server 1300 of the present embodiment domain router embodiment may be implemented as the method described above, the specific method embodiments the functions of each functional block may be implemented in accordance with the method described above, a specific implementation process can be referring to the related description of the embodiments is not repeated here. 为便于更好的实施本发明实施例的技术方案，本发明实施例中还提供一种通信系统。  For better implementation of the technical solutions of the embodiments of the present invention, the embodiment further provides a communication system according to the present invention. 参见图14、本发明实施例十一的一种通信系统可以包括:第一域路由器1410和第二域路由器1420。  Referring to FIG 14, embodiments of the present invention, a communication system may eleven comprising: a first domain router 1410 and a second domain router 1420. 第一域路由器1410，用于接收第一终端发送的第一数据包，其中，第一数据包携带第一用户的用户标识和第二用户的用户标识，第一终端归属第一用户，第二终端归属第二用户；利用第二用户的用户标识，查询第二终端连接的第二域路由器1420 ;向第二域路由器1420发送第一数据包。  The first domain router 1410, for receiving a first data packet sent by a first terminal, wherein the first user data packet carries a first user identifier and a second identifier of the user, a first user terminal belongs to a first , a second terminal belongs to a second user; user identifier of the second user, the second query domain router 1420 connected to the second terminal; transmitting a first data packet to a second domain router 1420. 第二域路由器1420，用于接收第一域路由器1410发送的第一数据包，其中，第一数据包携带第一用户的用户标识和第二用户的用户标识；利用第二用户的用户标识，查询第二终端的本地位置标识；根据第二终端的本地位置标识，向第二终端发送第一数据包。  The second domain router 1420, for receiving a first data packet 1410 sent by the first domain router, wherein the first user data packet carries a first user identifier and a second identifier of the user; the second user user ID, query the home location identifier of the second terminal; transmitting a first data packet to the second terminal according to the local location identifier of the second terminal. 在一种应用场景下，上述通信系统还可以包括用户位置服务器1430，第一域路由器1410可以向用户位置服务器1430发送查询请求消息，请求查询第二终端连接的第二域路由器1420的位置标识。  In one application scenario, the communication system may further include a user location server 1430, the first domain router 1410 may send a query to subscriber location server request message 1430, a second request to query the domain router connected to the second terminal 1420 location identification. 用户位置服务器1430，用于接收第一域路由器发送的查询请求消息，该查询请求消息携带第二用户的用户标识；根据第二用户的用户标识，查找第二终端连接的第二域路由器的位置标识；向第一域路由器发送查询响应消息，该查询响应消息携带第二域路由器的位置标识。  User Location Server 1430, a domain router first receives a query request message sent by the query request message carries the user identifier of the second user; according to a second identifier of the user, to find a second terminal connected to a second domain location identifier of the router; domain router sends a query to a first response message, the query response message carries the location identifier of the second domain router. 可以理解是的，本实施例的通信系统各个实体的功能可以根据上述方法实施例中的方法具体实现，其具体实现过程可参照上述实施例中的相关描述，此处不再赘述。  can be appreciated, the functions of the respective entities of a communication system according to the present embodiment in particular embodiments the method may be implemented in accordance with the above-described embodiment of the method, with reference to a specific implementation process of the above-described embodiments may be related description is not repeated here. 参见图15、本发明实施例十二的一种通信系统可以包括:域路由器1510和第一用户位置服务器1520。  Referring to FIG 15, embodiments of the present invention, a communication system 12 cases may include: a first domain router 1510 and the subscriber location server 1520. 其中，域路由器1510，用于获取第一终端的设备标识和第一用户的用户标识，其中，第一终端归属第一用户；向第一用户位置服务器1520发送第一路由注册消息，其中，第一路由注册消息携带第一终端的设备标识、第一用户的用户标识以及域路由器1510的位置标识(和/或域路由器1510的其它关联信息)。  wherein the domain router 1510, configured to obtain the device identifier of the first terminal and a first identifier of the user, wherein the first terminal belongs to a first user; sending a first registration message routing server 1520 to the first user position, wherein the first route registration message carries a terminal identifier of the first device, a first identifier of the user and the domain router location identifier 1510 (and / or other information associated with the domain router 1510). 第一用户位置服务器1520，用于接收第一路由注册消息；解析第一路由注册消息，获得第一终端的设备标识、第一用户的用户标识以及域路由器1510的位置标识；关联保存第一终端的设备标识、第一用户的用户标识以及域路由器1510的位置标识(和/或域路由器1510的其它关联信息)。  a first subscriber location server 1520, for receiving a first registration message routing; parsing a first route registration message, obtain the device identifier of the first terminal, a first identifier of the user and the domain router location identifier 1510; associate and store device identifier of the first terminal, a first identifier of the user and the domain router location identifier 1510 (and / or other information associated with the domain router 1510). 在一种应用场景下，域路由器1510还可以用于，为第一终端分配本地位置标识，将为第一终端分配本地位置标识通知给第一终端。  In one application scenario, the domain router 1510 may also be used, local location identifier assigned to a first terminal, a local location identifier is assigned to the first terminal notifies the first terminal. 在一种应用场景下，域路由器1510还可以用于，关联保存第一终端的本地位置标识和第一用户的用户标识(即保存第一终端的本地位置标识和第一用户的用户标识的关联关系)。  In one application scenario, the domain router 1510 may also be used, associated home location storing the first terminal identifier and a first identifier of the user (i.e., storing the first terminal identifier and a first home location user user association logo). 在一种应用场景下，网关或网络中的其它设备也可以为第一终端分配本地位置标识，并将为第一终端分配的本地位置标识通知域路由器1510，域路由器1510则可以直接关联保存第一用户的用户标识和该通知的第一终端的本地位置标识。  In one application scenario, the gateway or other network device location identifier may be assigned to the first local terminal and a first terminal assigned to the local domain router 1510 notifies location identifier, domain router 1510 may be directly local storage location identifier associated with a first user identifier and the first user terminal of the notification. 在一种应用场景下，若第一终端(第一用户)当前处于漫游状态，及第一终端的当前域为第一终端的拜访域，此时第一用户位置服务器1520为第一终端拜访域的用户位置服务器。  In one application scenario, when a first terminal (first user) is currently in a roaming state, and a first terminal of the current domain visited domain to a first terminal, a first case is a first subscriber location server 1520 visited location server user terminal domain. 通信系统还可以包括:第二用户位置服务器1530，其中，第二用户位置服务器1530第一终端(第一用户)的家乡域的用户位置服务器。  The communication system may further comprise: a second subscriber location server 1530, wherein the second location server 1530 a first user terminal (first user) the user's home domain server location. 此时，第一用户位置服务器1520还可以用于，向第二用户位置服务器1530发送第二路由注册消息，其中，第二路由注册消息携带第一终端的设备标识、第一用户的用户标识和第一域路由器的位置标识；和/或，还可以用于，向第二用户位置服务器1530发送第三路由注册消息，其中，第三路由注册消息携带第一终端的设备标识、第一用户的用户标识以及第一终端的当前域的域信息。  In this case, the first subscriber location server 1520 may also be configured to send a second registration message routing 1530 to the second subscriber location server, wherein the second route registration message carries the identifier of the first terminal device, a first user a first user identifier and location identifier of the domain router; and / or, can also be used, the third route 1530 transmits a user registration message to a second location server, wherein the third route registration message carries the identifier of the first terminal device, the first domain information of the current field and the user identifier of a user of the first terminal. 第二用户位置服务器1530，用于接收第一用户位置服务器1520发送的第二路由注册消息，从该第二路由注册消息获取第一终端的设备标识、第一用户的用户标识和第一域路由器的位置标识；关联保存获取的第一终端的设备标识、第一用户的用户标识和第一域路由器的位置标识(即保存第一终端的设备标识、第一用户的用户标识和第一域路由器的位置标识的关联关系)；和/或，用于接收第一用户位置服务器1520发送的第三路由注册消息，从该第三路由注册消息获取第一终端的设备标识、第一用户的用户标识以及第一终端的当前域的域信息；关联保存获取第一终端的设备标识、第一用户的用户标识以及第一终端的当前域的域信息(即保存第一终端的设备标识、第一用户的用户标识以及第一终端的当前域的域信息的关联关系)。  a second subscriber location server 1530, a second route for receiving a first registration message sent by the subscriber location server 1520, the first device identifier acquired from the second terminal registration message routing, a first user's user ID and location identifier of a domain router; position identification device identifier associated with a first terminal to store the retrieved first user's user ID and a first domain router (i.e., a terminal storing the first identification device, the first user's user ID and association of a location identifier of the domain router); and / or to receive a first subscriber location server 1520 third route registration message sent by a first terminal identifier acquiring device, a first user registration message from the third route the user terminal identifier and a first information field of the current field; associate and store the first terminal identifier acquiring device, information of the current field of the first domain identifier of the user and the first terminal (i.e., terminal identifier of the first storage device, relationship current domain information of the first domain and the first identifier of the user terminal). 可以理解是的，本实施例的通信系统各个实体的功能可以根据上述方法实施例中的方法具体实现，其具体实现过程可参照上述实施例中的相关描述，此处不再赘述。  can be appreciated, the functions of the respective entities of a communication system according to the present embodiment in particular embodiments the method may be implemented in accordance with the above-described embodiment of the method, with reference to a specific implementation process of the above-described embodiments may be related description is not repeated here. 根据第二终端的本地位置标识，向第二终端发送第一数据包。  The home location identifier of the second terminal transmits a first data packet to the second terminal. 在一种应用场景下，上述标识位于协议栈的用户标识层，或者，上述用户标识位于网络层。  In one application scenario, a user identifier identifying the above-mentioned layer is located in the protocol stack, or the user identifier at the network layer. 向第一域路由器发送修改包头的第一数据包。  transmitted to a first modification of the first domain router in the packet header. 向当前域的用户位置服务器发送路由注册消息，该路由注册消息携带第一终端的设备标识、第一用户的用户标识以及第一域路由器的关联信息。  transmitted to the subscriber location server routes the current domain registration message, the route registration message carries the identifier of the first terminal apparatus, information associated with a first user and a first user identifier of the domain router. 其中，上述第一域路由器的关联信息可以是各种能够将其和第一域路由器进行关联的信息，例如可以是第一域路由器的域名、第一路由器的位置标识或其它的关联信息等。  wherein association information of the first domain router may be capable of a variety of first domain router and its associated information, for example, a domain router first name, location or other identifier of the first router associated information. 保存第一终端的本地位置标识和第一用户的用户标识。  and the local location identifier of the first user terminal of a first user identity stored. 保存上述获取的第一终端的设备标识、第一用户的用户标识以及第一域路由器的关联信息。 A first terminal device identifier  store the acquired information associated with a first user and a first user identifier of the domain router. 向第二用户位置服务器发送第三路由注册消息，其中，第三路由注册消息携带第一终端的设备标识、第一用户的用户标识以及第一终端的当前域的域信息；其中，第二用户位置服务器为第一终端的家乡域的用户位置服务器。  transmitted to the second subscriber location server third route registration message, wherein the third route registration message carries the identifier of the first terminal device, the domain information of the current field and the user identifier of a first user of a first terminal; wherein, a second subscriber location server is a home domain of the subscriber location server of the first terminal. 在上述实施例中，对各个实施例的描述都各有侧重，某个实施例中没有详述的部分，可以参见其他实施例的相关描述。  In the above embodiment, the description of the various embodiments have different emphases, certain embodiments not detailed in part, be related descriptions in other embodiments. 综上所述，本发明实施例中基于用户标识模型，在网络中实现面向用户的通信；由于用户标识相对比较稳定，数据包的传输基于用户标识，通信可靠方便，有利于增强对用户移动性的支持，降低用户移动性管理的实现复杂度。  In summary, based on the user identity in the embodiment of the present invention Example model, implement user-oriented communication network; relatively stable since the user identifier, for transmitting data packets based on user identity, reliable and convenient communication, facilitate enhanced user mobility support, reducing implementation complexity of user mobility management. 进一步的，通信过程对丽需求相对较少，空口消耗相对较少；通信过程中终端的数据处理负荷相对较低，有利于降低终端的软硬件配置，降低成本；本发明实施例摒弃了传统的基于设备标识或基于IP地址的通信方式，有利于推进通信模式的演进和发展。  Further, communications through Chengdui Li demand is relatively small, a relatively small consumption of air interface; data processing load is relatively low during the communication terminal, terminal hardware and software configurations help to reduce the cost reduction; abandon embodiment of the present invention based on the traditional device ID or IP address-based communication, it will help promote the evolution and development of communication modes. 本领域普通技术人员可以理解上述实施例的各种方法中的全部或部分步骤是可以通过程序来指令相关的硬件来完成，该程序可以存储于一计算机可读存储介质中，存储介质可以包括:只读存储器(ROM, Read-Only Memory)、随机存储器(RAM, Random AccessMemory)、磁盘或光盘等。  Those of ordinary skill in the art can appreciate that various embodiments of the method of the above-described embodiments all or part of the steps may be relevant hardware instructed by a program, the program may be stored in a computer-readable storage medium, the storage medium It may include: a read only memory (ROM, Read-Only memory), a random access memory (RAM, random AccessMemory), a magnetic disk or optical disk. 以上对本发明实施例所提供的一种面向用户的通信方法和路由注册方法及设备及通信系统进行了详细介绍，本文中应用了具体个例对本发明的原理及实施方式进行了阐述，以上实施例的说明只是用于帮助理解本发明的方法及其核心思想；同时，对于本领域的一般技术人员，依据本发明的思想，在具体实施方式及应用范围上均会有改变之处，综上所述，本说明书内容不应理解为对本发明的限制。 Described in detail a user-oriented communication method and routing registration method and apparatus and a communication system provided in  the above embodiment of the present invention described herein through specific examples of the principles and embodiments of the invention are set forth, the above described embodiments are only used to help understand the method and core idea of ​​the present invention; the same time, for those of ordinary skill in the art, according to the idea of ​​the present invention, in the specific embodiments and application scope of the change, Therefore, the specification shall not be construed as limiting the present invention. 1.一种面向用户的通信方法，其特征在于，包括: 第一域路由器接收第一终端发送的第一数据包，其中，第一数据包携带第一用户的用户标识和第二用户的用户标识，第一终端归属第一用户，第二终端归属第二用户； 利用第二用户的用户标识，查询第二终端连接的第二域路由器； 向第二域路由器发送第一数据包，以便于第二域路由器将第一数据包发送给第二终端; 其中，第一数据包的包头包括:源用户标识字段和目的用户标识字段、源地址字段和目的地址字段，其中，所述源用户标识字段携带第一用户的用户标识，所述目的用户标识字段携带第二用户的用户标识。 CLAIMS 1. A communication method for a user, characterized by comprising: a first domain router first receives a first data packet sent by the terminal, wherein the first data packet includes a first identifier of the user and a second user's user identifier, a first user terminal belongs to a first, a second terminal belongs to a second user; user identifier of the second user, the second query domain router connected to the second terminal; transmitting a first data packet to a second domain router, in order to the second domain router first data packet to the second terminal; wherein the first data packet header comprising: a source user and a destination user identification field identification field, a source address field and a destination address field, wherein the source user identifier field carries a user identifier of the first user, the destination user identity field carries the user identifier of the second user. 2.根据权利要求1所述的方法，其特征在于，所述用户标识位于协议栈的用户标识层，或者， 所述用户标识位于网络层。 2. The method according to claim 1, wherein the user identifier in the user identifier layer protocol stack, or the user identifier at the network layer. 4.根据权利要求1所述的方法，其特征在于，所述向第二域路由器发送第一数据包，包括: 在第一数据包包头的源地址字段携带第一域路由器的位置标识，目的地址字段携带第二域路由器的位置标识，获得修改包头后的第一数据包； 向第二域路由器发送修改包头后的第一数据包。 4. The method according to claim 1, wherein said first transmission data packet to a second domain router, comprising: a first carrying position identifier domain router in a source address field of the first packet header, destination address field carries the identifier of the second domain router position to obtain a first modified data packet header; modifying the first transmit data packet header to a second domain router. 5.一种面向用户的通信方法，其特征在于，包括: 第二域路由器接收第一数据包，其中，第一数据包携带第一用户的用户标识和第二用户的用户标识，第二终端归属第二用户； 利用第二用户的用户标识，查询第二终端的本地位置标识； 根据第二终端的本地位置标识，向第二终端发送第一数据包； 其中，第一数据包的包头包括:源用户标识字段和目的用户标识字段、源地址字段和目的地址字段，其中，所述源用户标识字段携带第一用户的用户标识，所述目的用户标识字段携带第二用户的用户标识。 A user-oriented communication method characterized by comprising: a second domain router first receives a data packet, wherein the first user data packet carries a first user identifier and a second identifier of the user, a second terminal belongs to the second user; using the second user's user ID, query the home location identifier of the second terminal; transmitting a first data packet to the second terminal according to the local location identifier of the second terminal; wherein the first packet comprises header : source user and a destination user identification field identification field, a source address field and a destination address field, wherein, the source identifier field carries a first user identifier of the user, the destination user identity field carries the user identifier of the second user. 6.根据权利要求5所述的方法，其特征在于，所述用户标识位于协议栈的用户标识层， 或者，所述用户标识位于网络层。 6. The method as claimed in claim 5, wherein the user identifier in the user identifier layer protocol stack, or the user identifier at the network layer. 7.一种面向用户的通信方法，其特征在于，包括: 第二域路由器接收第二终端发送的第一数据包，其中，第一数据包的包头携带第一用户的用户标识、第二用户的用户标识以及第一终端连接的第一域路由器的位置标识，第一终端归属第一用户，第二终端归属第二用户； 修改第一数据包的包头，其中，修改后的第一数据包的包头携带第一用户的用户标识、第二用户的用户标识、第一终端连接的第一域路由器的位置标识以及第二域路由器的位置标识； 向第一域路由器发送修改包头的第一数据包； 其中，第一数据包的包头包括:源用户标识字段和目的用户标识字段、源地址字段和目的地址字段，其中，所述源用户标识字段携带第一用户的用户标识，所述目的用户标识字段携带第二用户的用户标识。 7. A communication method for a user, characterized by comprising: a second domain router first receives a data packet sent by the second terminal, wherein the header of the first packet carries a user identifier of the first user, the second user and a user identifier identifying the first location of the domain router connected to a first terminal, a first terminal belongs to a first user, a second terminal belongs to a second user; modifying a first data packet header, wherein the modified first data packet header carries the user identifier of the first user, the location identifier identifying the location of the first domain router a second identifier of the user, a first and a second terminal connected to the domain router; modifying the first data transmission to the first domain router header packets; wherein the first data packet header comprising: a source user and a destination user identification field identification field, a source address field and a destination address field, wherein, the source identifier field carries a first user identifier of the user, the destination user identity field carrying the second user's user ID. 8.一种域路由器，其特征在于，包括: 接收模块，用于接收第一终端发送的第一数据包，其中，第一数据包携带第一用户的用户标识和第二用户的用户标识，第一终端归属第一用户，第二终端归属第二用户； 查询模块，用于利用第二用户的用户标识，查询第二终端连接的第二域路由器； 发送模块，用于向第二域路由器发送第一数据包，以便于第二域路由器将第一数据包发送给第二终端； 其中，所述接收模块接收的第一数据包的包头包括:源用户标识字段和目的用户标识字段、源地址字段和目的地址字段，其中，所述源用户标识字段携带第一用户的用户标识，所述目的用户标识字段携带第二用户的用户标识。 A domain router, characterized by comprising: receiving means for receiving a first data packet sent by a first terminal, wherein the first data packet carries the user identifier and the second user of the first user's user ID, the first belongs to the first user terminal, a second terminal belongs to a second user; query module, for using the second user's user ID, query a second domain router connected to the second terminal; transmitting means for the second domain router transmitting a first data packet to the first data packet to a second domain router to a second terminal; wherein the first receiving module receives the data packet header comprising: a source user and a destination user identification field identification field, a source address field and a destination address field, wherein, the source identifier field carries a first user identifier of the user, the destination user identity field carries the user identifier of the second user. 9.根据权利要求8所述的域路由器，其特征在于， 所述查询模块包括: 第一发送子模块，用于向当前域的用户位置服务器发送携带第二用户的用户标识的消息，请求查询第二终端连接的第二域路由器的位置标识；` 接收获得子模块，用于接收所述当前域的用户位置服务器发送的携带第二域路由器的位置标识的消息，获得第二域路由器的位置标识。 9. The domain router according to claim 8, characterized in that the query module comprises: a first sending sub-module, configured to send a second message carrying the identifier of the user to the subscriber location server of the current domain, the query request location identifier of the second domain router connected to the second terminal; `receiving sub-module is obtained, a message carrying the location identifier of the second domain router receives the current position of the user domain sent by the server to obtain the position of the second domain router identity. 10.根据权利要求8所述的域路由器，其特征在于， 所述发送模块包括: 包头修改子模块，用于在第一数据包包头的源地址字段携带第一域路由器的位置标识，目的地址字段携带第二域路由器的位置标识，获得修改包头的第一数据包； 第二发送子模块，用于向第二域路由器发送修改包头的第一数据包。 10. The domain router according to claim 8, wherein the transmitting module comprises: a sub-header modification module configured to identify the location in the source address field of the first packet header carries a first domain router, the destination address field carries the location identifier of the second domain router, obtain a modified first data packet header; the second sending sub-module, configured to send the packet header modifying the first to the second domain router. 11.一种域路由器，其特征在于，包括: 接收模块，用于接收第一数据包，其中，第一数据包携带第一用户的用户标识和第二用户的用户标识，第二终端归属第二用户； 查询模块，用于利用第二用户的用户标识，查询第二终端的本地位置标识； 发送模块，用于根据所述查询模块查询的第二终端的本地位置标识，向第二终端发送第一数据包； 其中，第一数据包的包头包括:源用户标识字段和目的用户标识字段、源地址字段和目的地址字段，其中，所述源用户标识字段携带第一用户的用户标识，所述目的用户标识字段携带第二用户的用户标识。 A domain router, characterized by comprising: a receiving module, configured to receive a first data packet, wherein the first user data packet carries a first user identifier and a user identifier of the second user, the second terminal of the home second user; query module, for using the second user's user ID, query the home location identifier of the second terminal; and a sending module, according to the local location identifier of the second terminal of the querying module transmits to the second terminal a first data packet; wherein the first data packet header comprising: a source user and a destination user identification field identification field, a source address field and a destination address field, wherein the user identifier field source carrying the first user's user ID, the said destination user identifier field carrying the second user's user ID. 12.—种域路由器，其特征在于，包括: 接收模块，用于接收第二终端发送的第一数据包，其中，第一数据包的包头携带第一用户的用户标识、第二用户的用户标识以及第一终端连接的第一域路由器的位置标识，第一终端归属第一用户，第二终端归属第二用户； 包头修改模块，用于修改第一数据包的包头，其中，修改后的第一数据包的包头携带第一用户的用户标识、第二用户的用户标识、第一终端连接的第一域路由器的位置标识以及第二域路由器的位置标识； 发送模块，用于向第一域路由器发送所述包头修改模块修改包头的第一数据包； 其中，第一数据包的包头包括:源用户标识字段和目的用户标识字段、源地址字段和目的地址字段，其中，所述源用户标识字段携带第一用户的用户标识，所述目的用户标识字段携带第二用户的用户标识。 12.- species domain router, characterized by comprising: receiving means for receiving a first data packet sent by the second terminal, wherein the first packet header carrying a first identifier of the user, the second user's user and a location identifier identifying the first domain router connected to a first terminal, a first terminal belongs to a first user, a second terminal belongs to a second user; header modification module for modifying the header of the first packet, wherein the modified a first data packet header carrying a first identifier of the user, the location identifier identifying the location of the first domain router a second identifier of the user, a first and a second terminal connected to the domain router; transmitting module, for the first domain router transmits the packet header modification module modifying the first data packet header; wherein the first data packet header comprising: a source user and a destination user identification field identification field, a source address field and a destination address field, wherein the source user a first user identity field carries a user identifier, the user identifier field carrying the second object of the user's user ID. 13.—种通信系统，其特征在于，包括: 第一域路由器，用于接收第一终端发送的第一数据包，其中，第一数据包携带第一用户的用户标识和第二用户的用户标识，第一终端归属第一用户，第二终端归属第二用户；利用第二用户的用户标识，查询第二终端连接的第二域路由器；向第二域路由器发送第一数据包；其中，第一数据包的包头包括:源用户标识字段和目的用户标识字段、源地址字段和目的地址字段，其中，所述源用户标识字段携带第一用户的用户标识，所述目的用户标识字段携带第二用户的用户标识； 第二域路由器，用于接收第一域路由器发送的第一数据包，其中，第一数据包携带第一用户的用户标识和第二用户的用户标识；利用第二用户的用户标识，查询第二终端的本地位置标识；根据第二终端的本地位置标识，向第二终端发送第一数据包 13.- species communication system, comprising: a first domain router, for receiving a first data packet sent by a first terminal, wherein the first data packet includes a first identifier of the user and a second user's user identifier, a first user terminal belongs to a first, a second terminal belongs to a second user; user identifier of the second user, the second query domain router connected to the second terminal; transmitting a first data packet to a second domain router; wherein, a first data packet header comprising: a source user and a destination user identification field identification field, a source address field and a destination address field, wherein, the source identifier field carries a first user identifier of the user, the destination user identity field carries first two user identifier of a user; second domain router, receiving a first packet for a first transmission of the domain router, wherein the first user data packet carries a first user identifier and a second identifier of the user; the second user user ID, query the home location of the second terminal identifier; according to the local location identifier of the second terminal, transmitting a first data packet to the second terminal 。 .